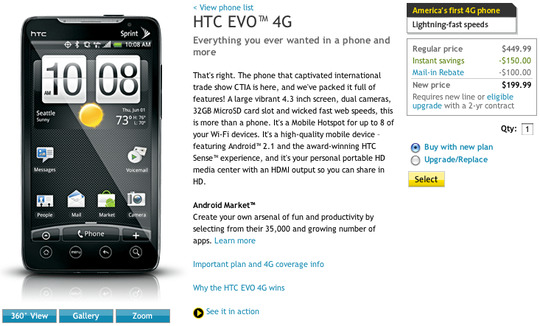 The new and much talked about Evo 4G by HTC is on sale now via Sprint's online store! It will run you $199 with a two year contract after $100 mail-in rebate and $150 instant saving. The Evo 4G is a duel mode 3G/4G mobile phone with a huge 4.3" touch screen, two cameras with a main 8MP camera and two-way video calling, personal WiFi hotspot and HDMI output. It's powered by a 1GHz Snapdragon processor and has the Android 2.1 by Google operating system.